I must be coming down with something. There must be something in the water. I’m ailed in some way with something: I’m a sweater knitter, through and through. But we just don’t have the weather here for it – I have to wear my rain jacket ALL 90% of the time. Instead, I have been trying to find other projects that are as fulfilling as sweater knitting. 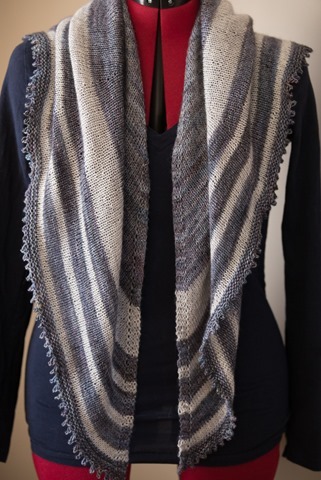 It’s not quite the same thing but I did cast on for this amazing shawl back in 2014 and knit away on it I did. 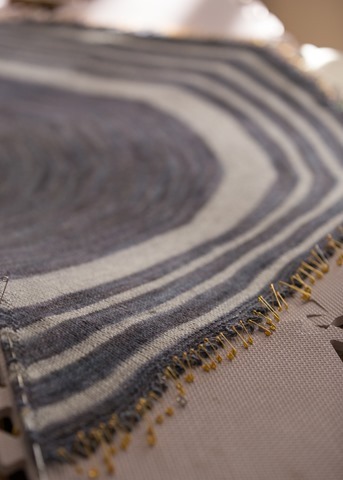 I have been wearing it a ton and I have to admit, what really makes this shawl is the yarn. I blocked this as large as I possibly could as I wanted something oversized and huge. 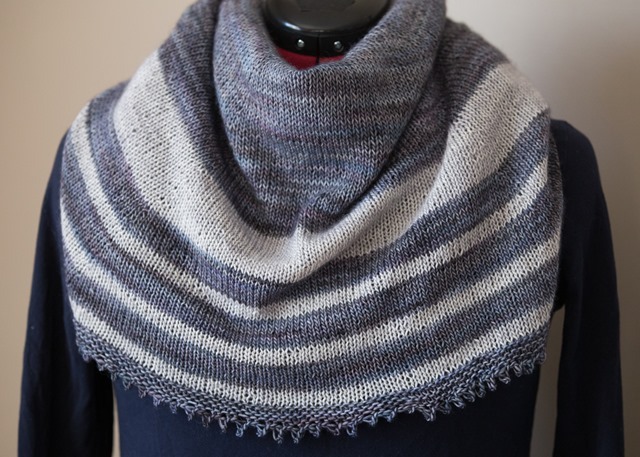 It’s not as large as I would have liked but if I’d stuck with what the pattern calls for (which is change between DK and lace weight yarns in the same colourway), I think it would have been bigger. Instead I chose to stripe it because I really wanted something interesting next to my plain solid-coloured purple rain jacket (that I live in 9 months of the year; the other 3 winter months, I live in this). I always think picot bind off is going to take forever but once again, it went swimmingly. I was finished in one evening and by the end of the week, I was wearing this under my jacket! Again, sorry for the dress form photos – I mentioned in my last post that while M is away at work in the day, we have been having the most amazing natural light coming in so I’ve gone ahead and done photos. One FO that I’m looking forward to showing you has to be photographed on me, so hopefully we will get photos this weekend and I can show you next week! How do you define yourself as a knitter? A sock knitter, sweater knitter, shawl knitter? What are your favourite projects to work on? Previous Post yarn + lace + jacket = love. Next Post summing up January. The shawl is so pretty! 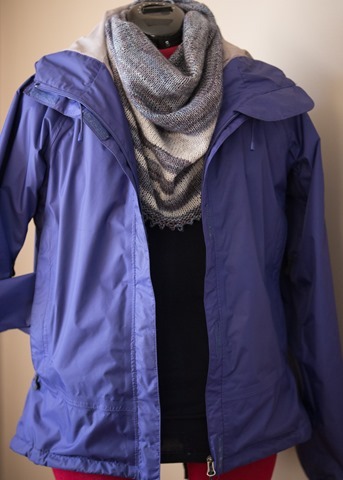 I’m still newish to knitting so still defining who I am as a knitting but love scarves and cowls. Thank you!! 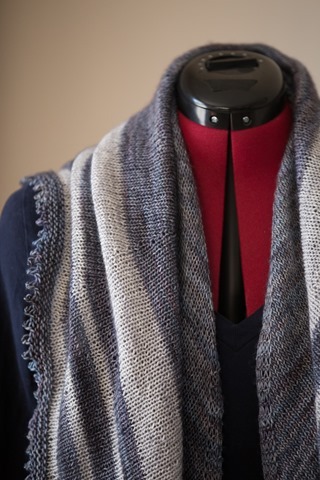 This is a great beginner pattern actually – there no chart or crazy instructions and you end up with a gorgeous product at the end! Beautiful shawl. I am a shawl and hat knitter. But do enjoy the few sweaters I’ve made. Just need to dedicate myself to knit more sweaters. Thank you! Yes, sweater do take a certain amount of staying power to get through! !